The entry for kime in Wikipedia refers to "instantaneous tensing at the correct moment during a technique." This is a physical or biomechanical definition of the English term 'focus', in comparison to what you may think of focus to mean 'concentration' or to be 'in the zone'. The noun for kime means "to decide" which for hard style martial arts could indicate the point at which you've designated for your technique to stop. 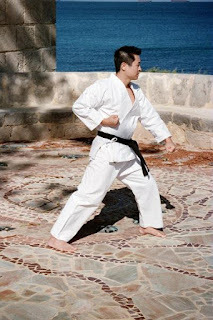 Hardan markgi - the lead arm is crossed in front of the face, folded on the side of the opposite ear, cuts downward, and stops on a point right at the edge of the shoulder line. At the point of impact, the legs drop lower, the abs tense, and the entire body becomes united by that one motion. This is 'Kime 決め | Gyeoljeong 결정 | Focus'. Imagine having a limb pulled taut by the chambered arm, and having a strike which accelerates 70kg of body weight right on your arm. It would not only destroy your arm, the pain would sear upward and debilitate your ability to continue. Photo taken 2004 in front of Cottesloe Beach. By 'instantaneous tensing,' this refers to the deceleration that occurs whilst you are stopping a motion, and the muscle lock down of your skeletal system brings the process to a complete halt. For a down block or hardan markgi, this could be the point 45 degrees down from your shoulder, at the shoulder frame, and over the knee where the hardan markgi is performed. The resulting muscle lock down refers to the 'instantaneous tensing' in order for the entire body to perform the strike - as simply just waving your hand and moving it into the right position means you've only moved a small portion of your body mass towards the target. The more you get the 'instantaneous tensing' timed with the strike, the more impressive, and the more powerful the strike. Many people mistakenly believe that they need to put in more movement or more muscle to gain more power. It is true in a sense - if you can pack on 30 pounds more muscle, you will gain a significant amount more striking power. However, this kind of paradigm puts a lower ceiling to your power generation ability - mostly limited by the limb that you're swinging. You could also interpret 'focus' is to dedicate your entire training, your entire spirit, and your entire being to that single strike. Your body has been willed into one point. Few people who've never embarked on warrior training would understand this kind of mindset. Note: Thank you to my friend Ørjan Nilsen of Traditional Taekwondo Ramblings and his martial art network for the translation of Japanese term to Korean.